With this blog I am not going to explain QoS in technical detail. I will give you some links to technical resources that were useful to me. And I will explain what you can and need to configure in UCS Manager. 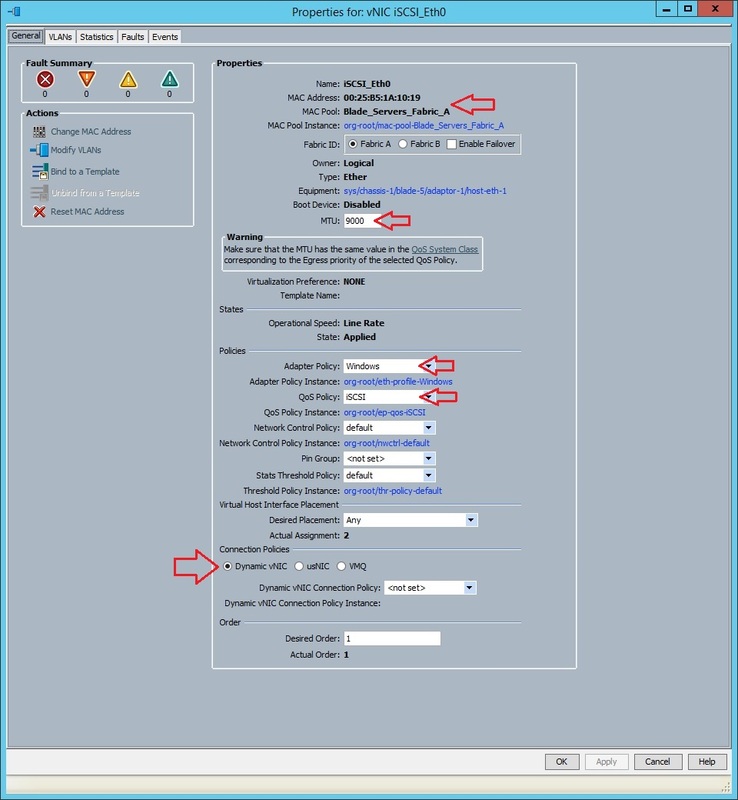 The first thing you need to configure in UCS Manager are the properties of the QoS System Class. You cannot rename them, but you can change their properties as shown in the screen-capture above. Once you have configured the QoS System Class you can configure so call QoS Policies and finally link those policies to vNIC’s and vHBA’s, which I will explain in a moment. Before I explain QoS Policies first allow me to explain some important properties of the QoS System Class. You can configure each priority with a CoS (Class of Services) value. QoS accepts a CoS value of 0 to 7, whereas 0 and 7 are reserved by the system, and 3 is reserved by Fiber Channel. So apart from a CoS value of 3 you can configure 1, 2, 4, 5 and 6 for the remaining priorities. CoS operates only on 802.1Q VLAN ethernet, at the data link layer (layer 2). A CoS value is tagged outbound in the 802.11Q frame so that other network devices receive it inbound. You can configure each priority with a MTU packet size to match your requirement. Except for Fiber Channel which has a fixed MTU packet size of 2240. As you might know, it is common to enable Jumbo Frames (MTU 9000) for an iSCSI and Live Migration Network. Or maybe you want to enabled Jumbo Frames over the entire system. The CVD (Cisco Validated Designs) have their best-practices in terms MTU values. So it is best to follow those designs and make sure they match your uplink devices. NOTE: The MTU Packet Size value is not the value that is applied to a vNIC or vHBA. Because a vNIC or vHBA has it’s own property to configure a MTU packet size. This value is used when traffic from other devices (like uplink switches) arrive at the FI’s which have tagged the same CoS value. Imagine you have a storage system (either iSCSI or Fiber Channel) that has QoS configured and tags a CoS value to the storage traffic. When that storage traffic arrives at an FI it will know how to handle the traffic according the QoS System Class. This also applies to a UCS Server on which you have configured QoS in the Operating System. As the name suggest, the ‘weight’ value defines the amount of weight (%) a priority has when the network is congested. As the screen-capture above shows the priority named ‘Gold’ has a weight value of 9. With all weight together this equals to 40% of the entire bandwidth. NOTE: Using the sceen-capture as an example; Traffic tagged as ‘Gold’ can use almost 100% of available bandwidth. But once the network gets congested it will be limited to 40% bandwidth. So it is important that you think through what different type of traffic you have and how you want to classify them with QoS. One thing to keep in mind, always make sure your storage traffic (whether it is iSCSI or Fiber Channel) has enough bandwidth to operate properly. Also make sure it uses the right MTU packet size and has no packet loss. Once you have configured the QoS System Class you are ready to configure QoS Policies. The screen-capture above is just one example. As you can see you have to select a ‘priority’ which you have configured earlier. The ‘Burst(Bytes)’ value essentially means the NIC speed. If you configure a value of 10240 and link the QoS Policy to a vNIC it will operate as a 10GbE NIC. If you configure it as 1024 it will operate as a 1GbE NIC. UCS even allows you to configure uncommon values like 2048 for 2GbE. As mentioned the CoS value is tagged to the 802.11Q frame. The ‘Host Control’ setting defines whether the Operating System on a UCS Server is allowed to control QoS. If you have already configured QoS on your Operating System using CoS values, and do you do not want it to be overwritten by UCS you should set the ‘Host Control’ setting to ‘Full’. Notice the QoS Policy ‘iSCSI’ is assigned. And also notice that the vNIC has it’s own property for the MTU packet size. The really nice thing about all this is, QoS is easy to configure. You only configure the QoS System Class once. 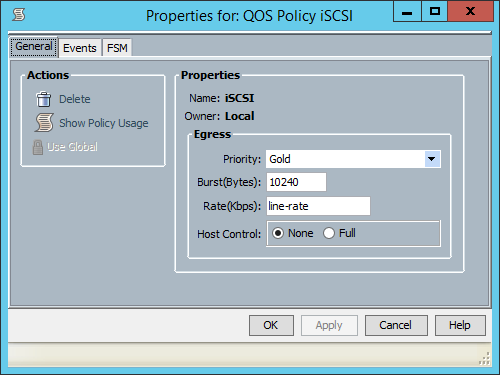 Then you create some QoS Policies as you want and apply them to a vNIC or vHBA. If you would implement a Hyper-V Cluster you can configure QoS on each vNIC of a Hyper-V Server. This will make sure traffic is shaped accordingly. Now, there is something I need to share. During the design and implementation of our FlexPod environment I had a challange and found something that was not well documented in the CVD (Cisco Validated Designs). I was able to solve it but it took me some time to master. That is the reason why I wanted to add this part in the first place. First of all, QoS is very easy to configure with Cisco UCS Manager. No CLI, just UCS Manager quick and easy. UCS Manager covers the entire UCS system. But in our infrastructure we use iSCSI over the entire system. I would have preferred Fiber Channel, but that was just not the case. We have connected two uplink Cisco Nexus 5548UP switches. And our NetApp Storage Array is connected to those switches. Please refer to the connectivity overview of part 2 from this blog. We wanted normal network traffic to use a default MTU packet size of 1500, and iSCSI traffic to use a MTU packet size of 9000 (Jumbo Frames). The thing is, with a Nexus 9000 series switch you can configure MTU values per VLAN. But with a Nexus 5500 series switch you cannot. Instead you can enable it over the entire switch for all traffic, or by manually configuring QoS. Back then I had no experience with QoS on Nexus, so I had to investigate it. The following excellent blogs and video from Matt Oswalt provided me all the information I needed. Does the storage system set the CoS field on a vlan tagged frame? Now we are able to configure Hyper-V Servers the way we want. Just easily add as many vNICs we want, apply the right QoS Policies on them and have optimal performance. Ok, that’s it for now. I hope this information was informative. Click on the link below to continue with the next part. Good illustrations, very well laid out information, super work. Thank you. Just for your information; all parts are now published. Nice post well explained. Thanks!